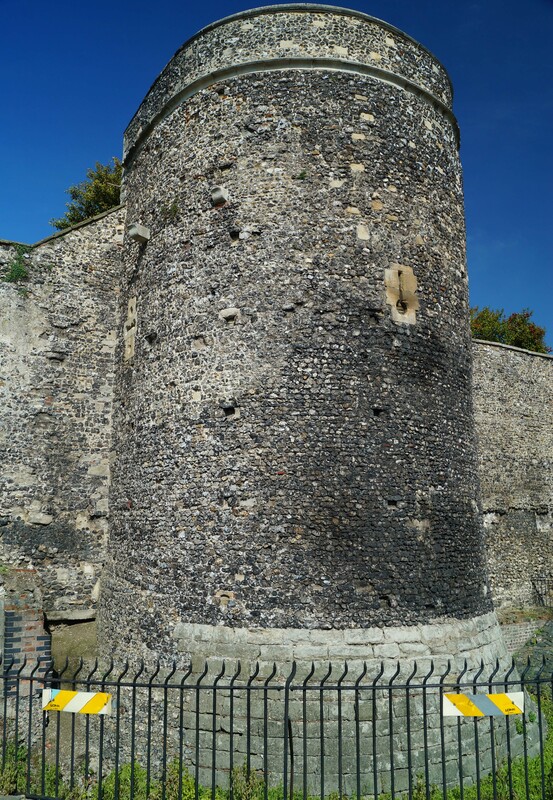 Canterbury was fortified by the Roman in the third century AD. These walls were still standing in the late 1060s when the Normans built a motte-and-bailey fortification there. 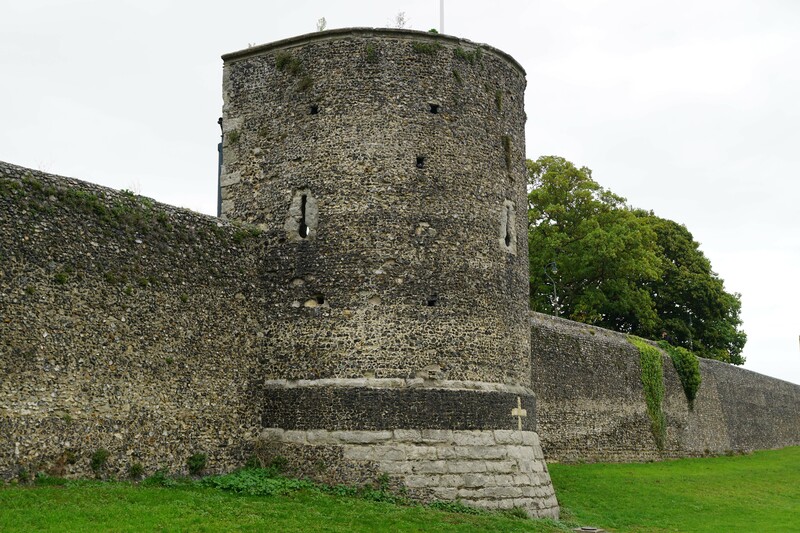 This was replaced with Canterbury Castle in the late eleventh century. The town walls were rebuilt in the fourteenth century. Canterbury stands at a crossing point over the River Stour, once a major waterway that flowed into the Wantsum Channel. Although it is now silted up, this channel originally separated the Isle of Thanet from the mainland and provided both a sheltered anchorage and easy access to the sea. 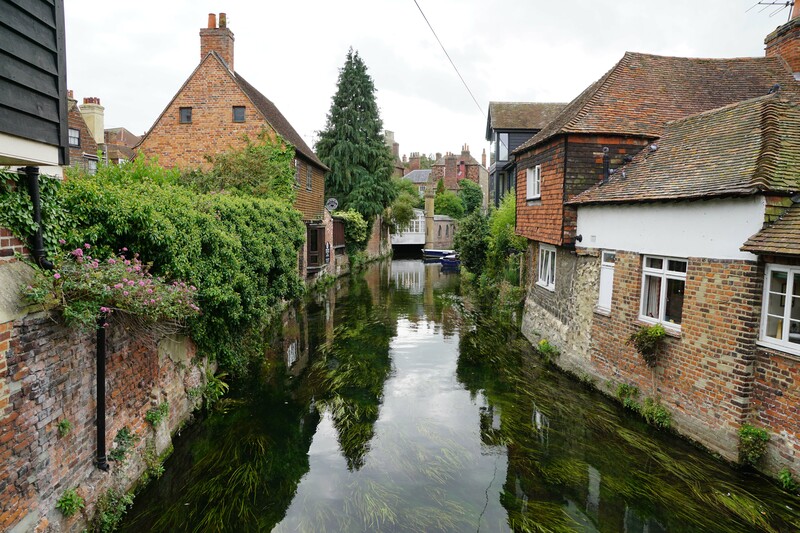 Collectively these waterways, which would have facilitated trade and communication with the wider region, made Canterbury and its hinterland prime real-estate. Accordingly the site has been occupied since at least the Neolithic (4,000 BC to 2,500 BC) period if not long before. This early settlement grew in size significantly during the first century BC when settlers from Belgium, known as the Belgae, moved into the area. They established a hillfort at Bigbury and, by the first century AD, this had become a caput for the Cantiaci tribe who occupied most of modern day Kent. 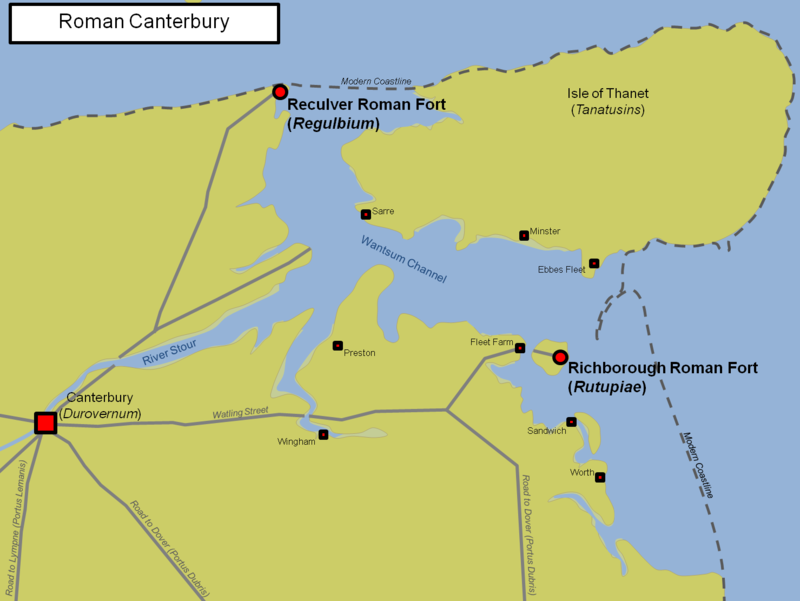 The Romans invaded Britain in AD 43 with the bulk of their forces landing in eastern Kent, most probably at Richborough (Rutupiae). Archaeological evidence suggests they raised an earth and timber fort at Canterbury at this time, presumably to secure control over the River Stour. Southern England was soon firmly under Roman control and it is probable they were directly supported by the Cantiaci. In the decades that followed, the Romans embarked upon a re-organisation of civilian administration with new towns built to replace former tribal caputs. Around AD 70 Canterbury was laid out as a planned town to serve as a replacement for the Bigbury hillfort. The town occupied an area of around 100 acres and included all the public buildings expected in a Roman town including a forum, town hall (Basilicia), public baths, amphitheatre and temples. The town was known as Durovernum Cantiacorum. Roman roads fanned out from the site in all directions providing direct connections to London, Lympne, Dover, Richborough, Thanet and Reculver. 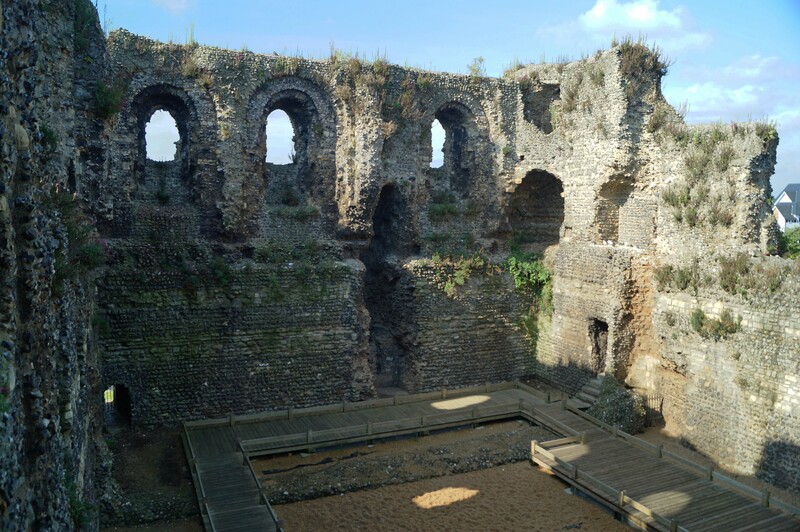 Canterbury Roman Fort itself was probably decommissioned currently with the establishment of the new town. When originally founded, the Roman town did not have had any defences although the town boundary may well have been defined by a ditch or earth rampart for taxation and/or administrative purposes. However, in the latter half of the third century AD southern England was suffering sea-borne attacks from Saxon and Frankish raiders. Despite Roman Forts at Reculver and Richborough, which protected both ends of the Wantsum Channel, Cambridge was deemed vulnerable and accordingly work started on town walls around AD 270. The walls had an irregular trace and enclosed both the town grid and its immediate hinterland, an area of around 120 acres. 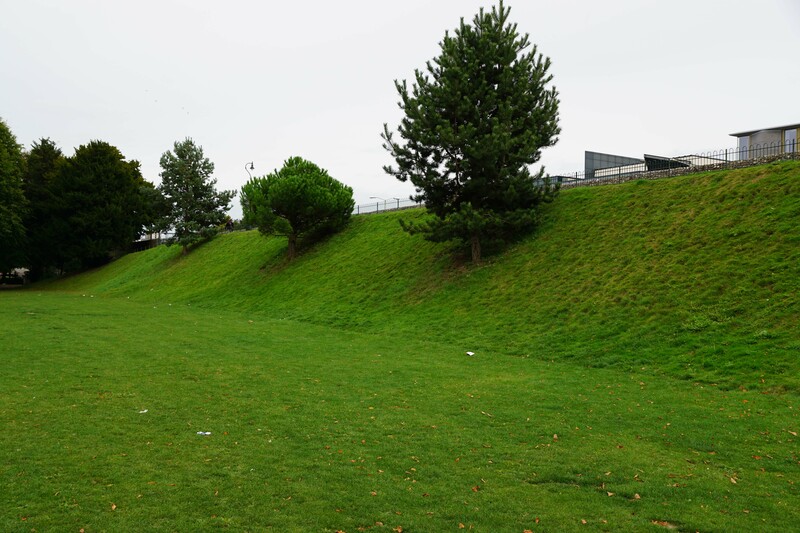 The wall was built from locally sourced flint, stood around six metres tall and was backed with an earth rampart. A deep ditch was built in front of the wall. Seven gates provided access: North Gate, Quenin Gate, Burgate, Ridingate, Worthgate, London Gate and West Gate. 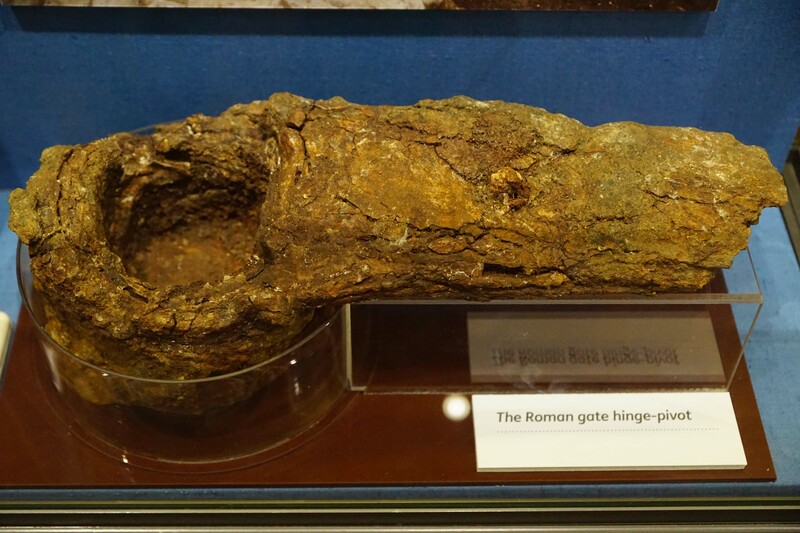 A hinge from one of the Roman gates on display in the museum. Roman Canterbury had direct access to the Wantsum Channel. 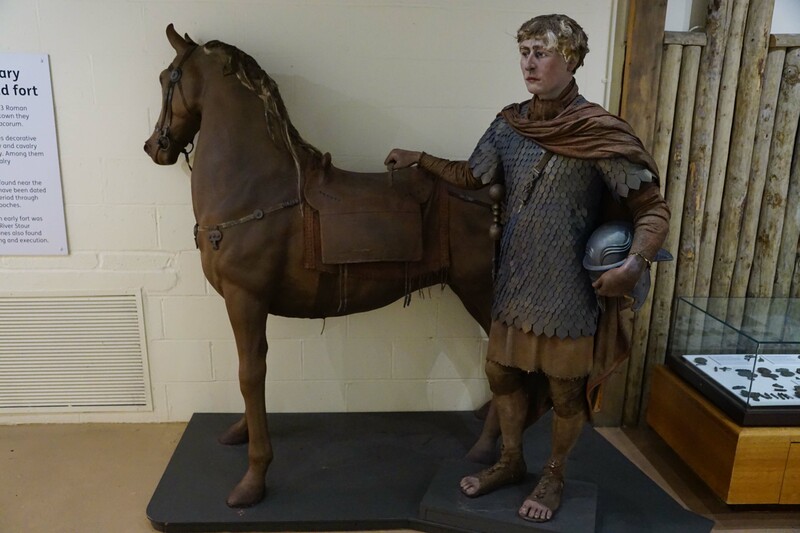 Britain ceased to be part of the Roman Empire in the early fifth century and in the decades that followed town life in Canterbury slowly came to an end. There was probably no single exodus but, as the wider area returned to a more subsistence based existence, the trade and economic links that sustained the town simply came to an end. Nevertheless, Canterbury did continue in one form or another and by the early sixth century AD was populated by the Jutes, immigrants from Germany. They called the town Cantwareburgh which later became corrupted into the modern name. St Augustine arrived in AD 597 and founded the Cathedral and a Benedictine Abbey. In AD 672 Canterbury had become the leading ecclesiastical see in England. Aside from its growing role as a religious centre, Canterbury was also an important Royal town. By the early seventh century AD coins were being minted there and it was the caput of the Kingdom of Kent. Unfortunately this meant it attracted the attention of the Danes who raided the town in 842, 851, 991 and 1011. On the final occasion the town withstood a siege for twenty days suggesting the Roman town walls were still functional at this time. 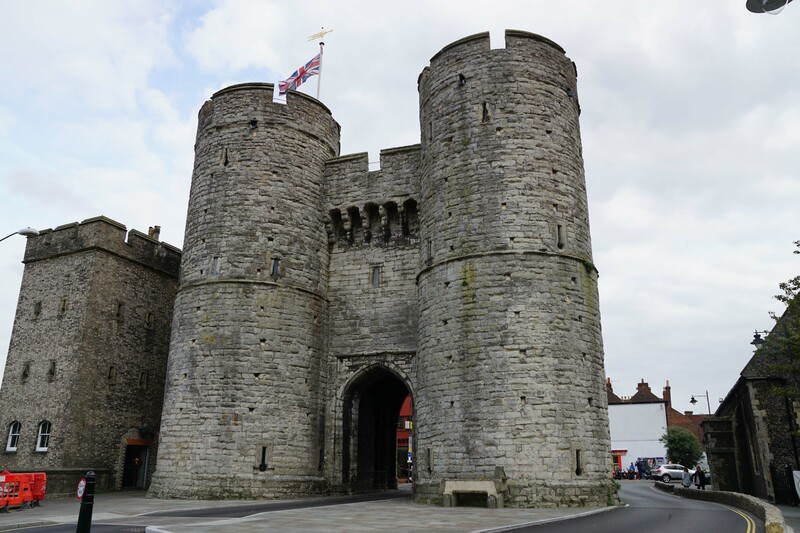 Following the Norman victory at the Battle of Hastings (1066), Canterbury was the first English town to submit to William the Conqueror without a struggle. However, despite the lack of resistance, the regional importance of the town prompted the Normans to construct an earth and timber motte-and-bailey fortification within its walls. A Bronze Age barrow, which had later been re-used as a Romano-British cemetery, was adapted to serve as the motte. This was located directly adjacent to the south-eastern portion of the Roman town walls and incorporated them into its defences. An Inner Bailey extended to the north-west and was protected by a substantial ditch and timber palisade. An Outer Bailey may have extended to the south-east of the motte beyond the Roman wall. The Domesday survey of 1086 recorded that eleven houses were destroyed to make space for the fortification and that the King had to purchase the land from the church; records show he granted the Archbishop of Canterbury (the rent from) seven houses and the Abbot of St Augustine fourteen houses in compensation. 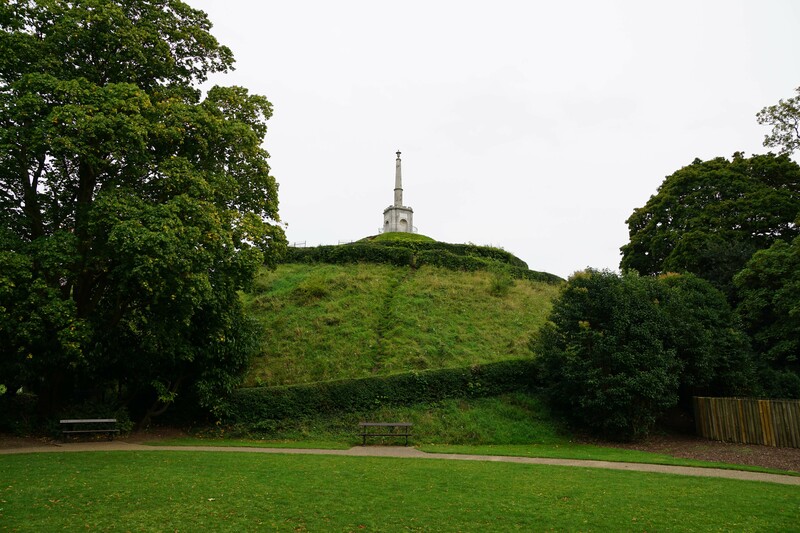 Dane John mound, a Roman-British burial mound that the Normans converted into a castle. The castle was rebuilt in stone between 1085 and 1125 in a slightly different location from the original Norman fortification. The new complex was located 200 metres to the west. The centrepiece was a square Keep built from flint and Caen stone blocks. 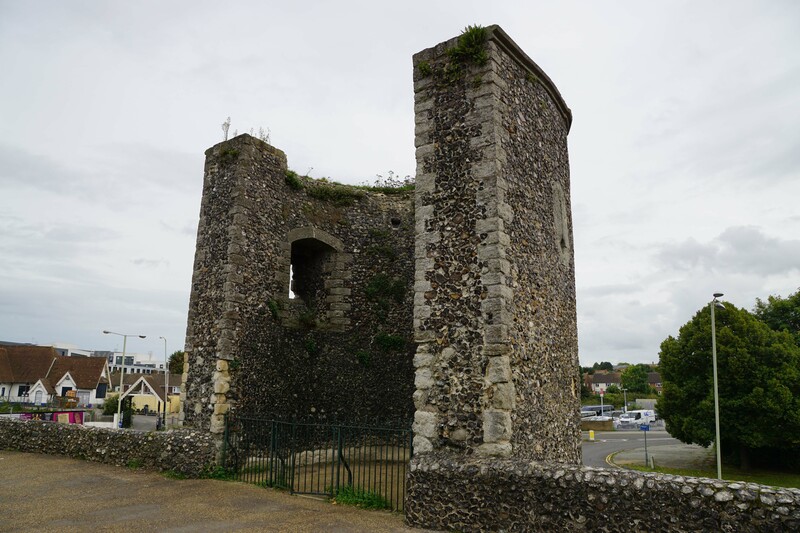 This tower originally stood at least three storeys tall. The interior was divided by two cross walls with the internal compartments lit by four arched windows on each side of the Keep. Two spiral staircases provided access to all levels. 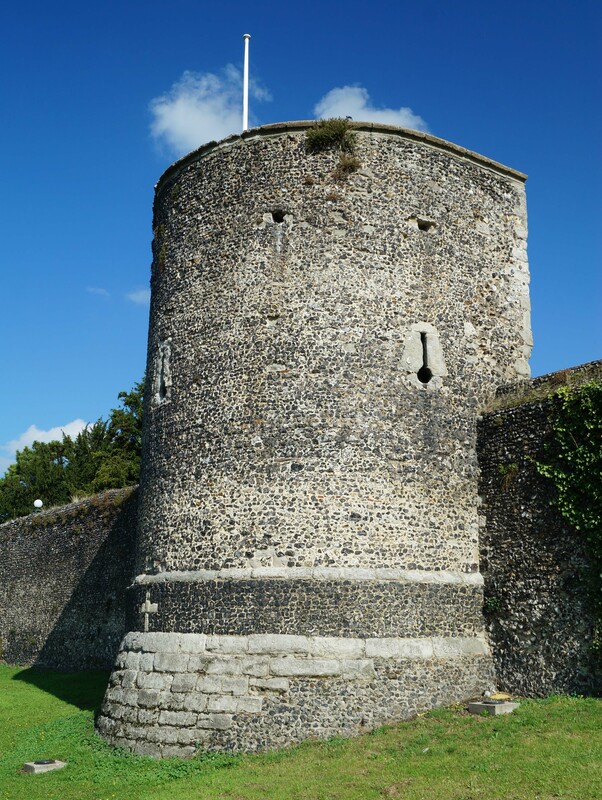 The tower was positioned within a rectangular bailey that used the Roman town wall for its south and west sides whilst a new stone built wall completed the enclosure. Turrets occupied each angle. The site incorporated one of the access points into the town, Worth Gate. It is uncertain if this bailey was constructed concurrently with the tower as it wasn't until 1169, perhaps half a century after the new castle was started, that compensation was finally paid for the land lost to the bailey. 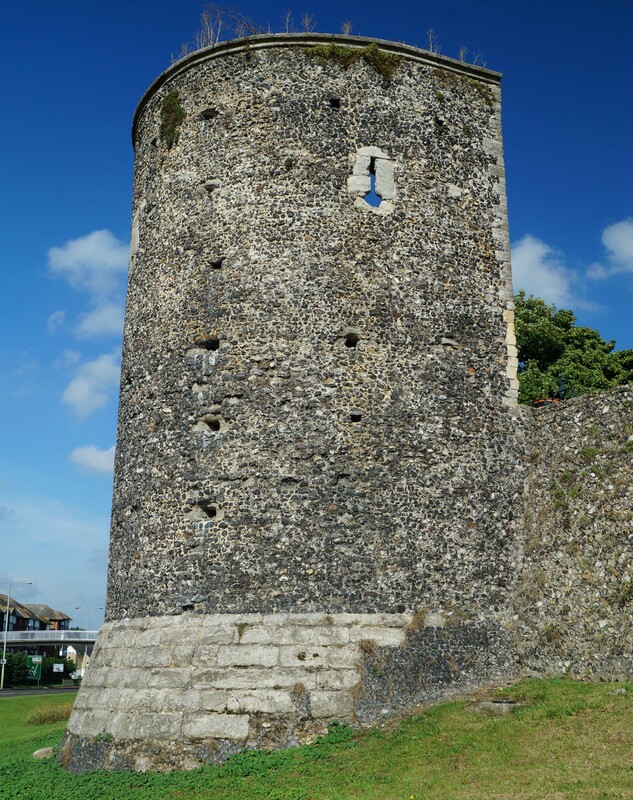 Canterbury Castle was captured in 1216 by Baronial-French forces during the First Barons' War. It was recovered after the war and Henry III subsequently built new private chambers there. In 1277 it was used to incarcerate Jews during Edward I's persecution of them. Thereafter its use as a gaol became an enduring role and by 1293 it was being exclusively used in this capacity. This continued for over three hundred years culminating in Queen Mary use of the site to imprison Protestants; between 155 and 1557 a total of 42 people were starved or burned to death within the castle. Thereafter the castle seems to have gone out of use and by 1609 it was an abandoned ruin. It was sold to Sir Anthony Weldon in 1609. 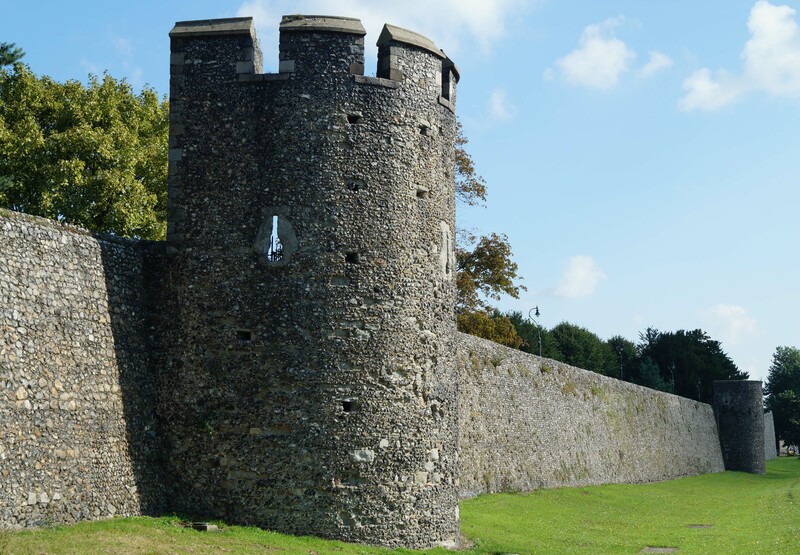 Throughout the majority of the medieval period, Canterbury relied upon the Roman town walls to provide defence. The Pipe Rolls indicate some expenditure in 1166 and 1167 to maintain these ancient defences. However, a report dated 1363 indicates the walls were in a poor condition. Concurrently England's fortunes in the Hundred Years War were at a low ebb and an attack on the south coast seemed likely. Murage, the right to raised taxes to fund defences, was granted in 1378. Further grants followed in 1379, 1385 and 1402. The work was well underway by the early 1380s and consisted of rebuilding the town wall along the same line as the earlier Roman defences. At least twenty-one towers, many with gun-loops, were added to the circuit. Construction of the walls was slow - Henry IV was unhappy with progress in 1403 and work was still ongoing ninety years later. This accounts for the differing styles, for example the towers on the south-east and D-shaped vice the ones in the north-east which are square. 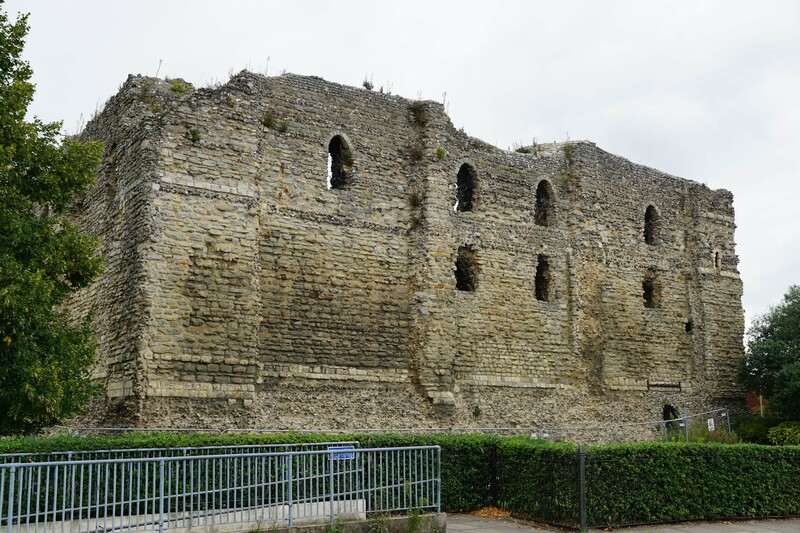 The town walls were built in the late fourteenth and fifteenth centuries over the remains of the Roman wall. The town walls were still standing during the seventeenth century Civil War. 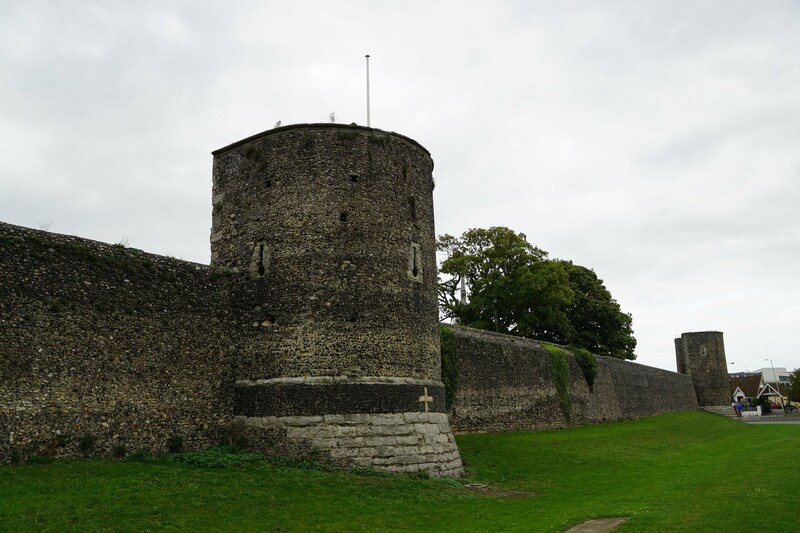 The town saw no action during the First Civil War as Kent was firmly in the Parliamentary sphere of influence although some preparations for defence were made including modifying the Dane John mound, the former Norman castle, into an artillery battery. Nevertheless, by late 1647 the town's populace became extremely hostile to the Government following the prohibition on celebrating Christmas. Riots started and a Parliamentary army, under Colonel Henry Ireton, was forced to occupy the town. He commenced the demolition of the western portion of the town walls at this time. Notwithstanding the portion demolished by Colonel Ireton, the remaining portions of the town walls remained standing until the 1780s when most of the gates were demolished to improve access for coaches. With the exception of the Keep and a small portion of the bailey wall, the castle was demolished in 1792. The Keep fared little better and in 1817 the top storey was demolished to convert it into a store for a gas-light company. The castle was purchased by the Council in 1928. Harmsworth, A (2004). Roman Canterbury. 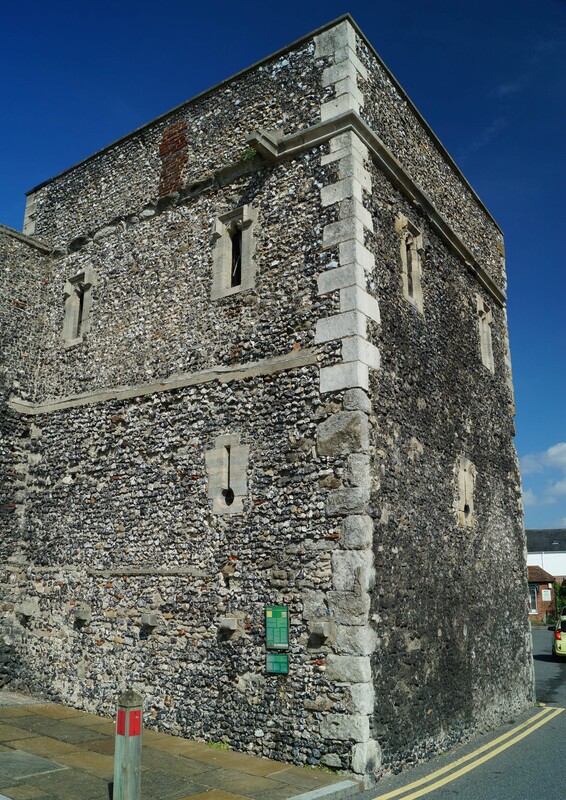 Canterbury Archaeological Trust. Historic England (1949). 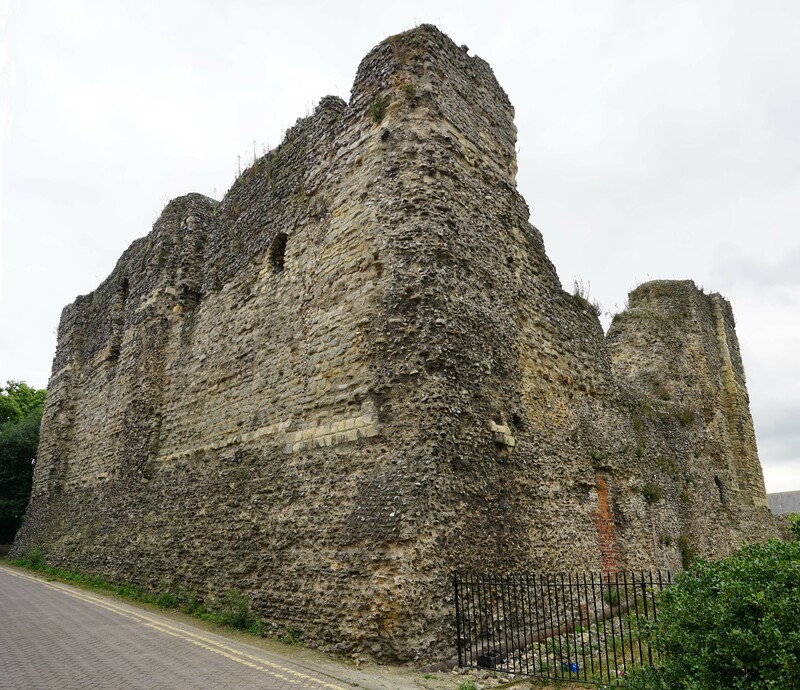 Canterbury Castle, List entry 1252100. Historic England, London. Salter, M (2002). The Castles of Kent, Surrey and Sussex. Folly Publications, Malvern. Salter, M (2002). Medieval Walled Towns. Folly Publications, Malvern. 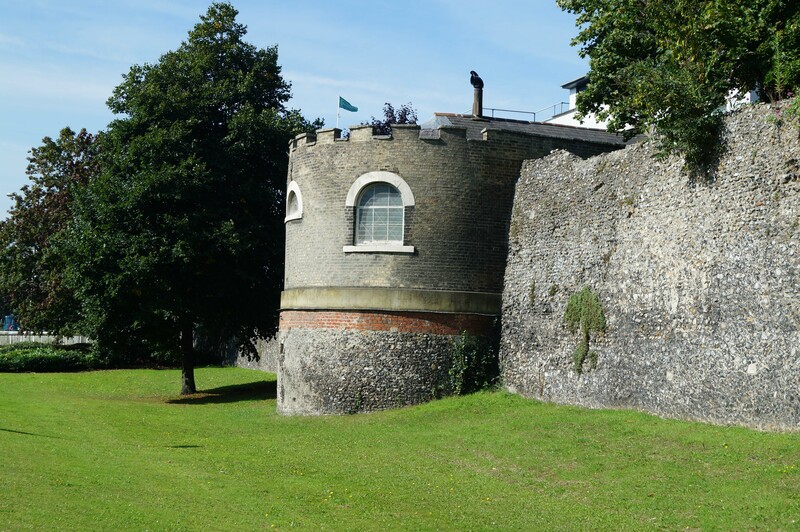 Canterbury Castle is part of a public park and open to the public although structural instability has forced a number of long term closures. Significant portions of the town walls, including seventeen towers, are also visible and the West Gate has survived. 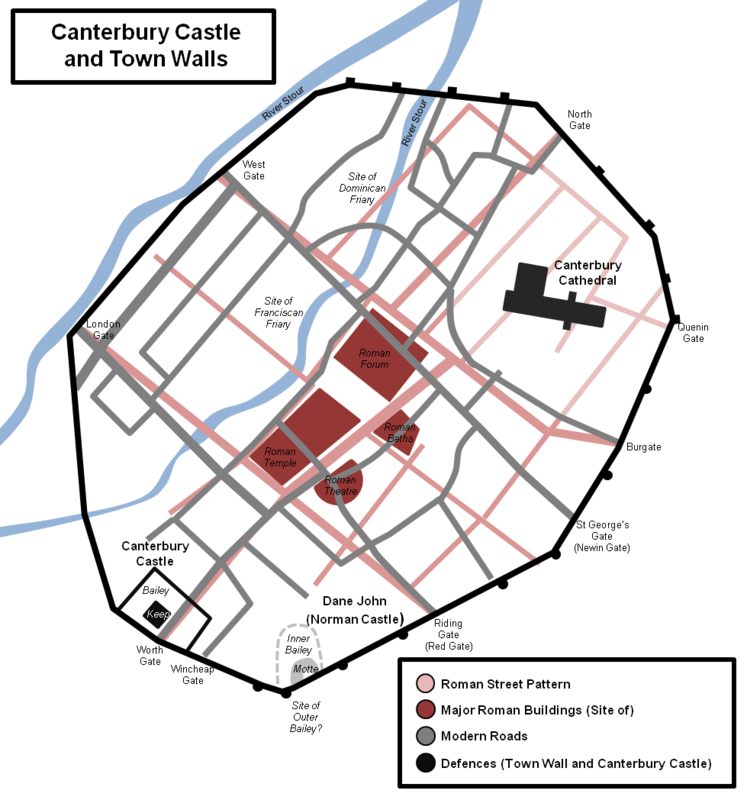 Canterbury Castles and Town Walls Layout. The town walls enclosed a broadly oval area. Both castles were built next to the town wall and used it in their defences. The western portion of the wall was demolished during the Civil Wars. Dane John (Norman Motte). 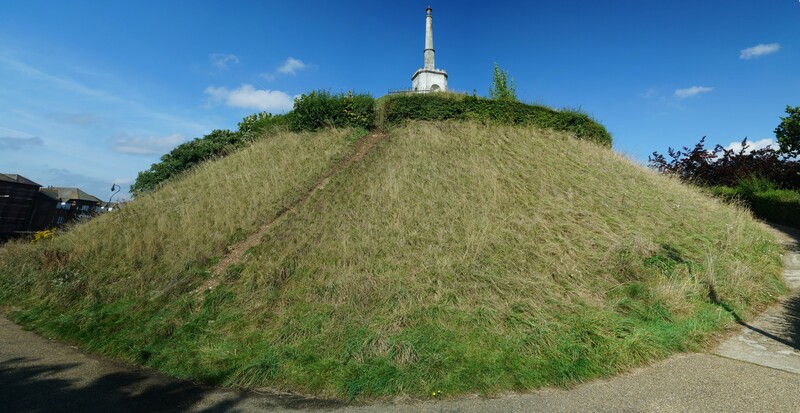 The motte of the early Norman castles survives and is now known as Dane John, a title given to it by an antiquarian in the seventeenth century who claimed it was the Danes who built it. This is incorrect, it was a Romano-British burial mound adapted from an earlier Bronze Age barrow. Prior to its renaming it was known as Dungeon Hill. Dane John mound was landscaped in 1790 as part of a pleasure garden. 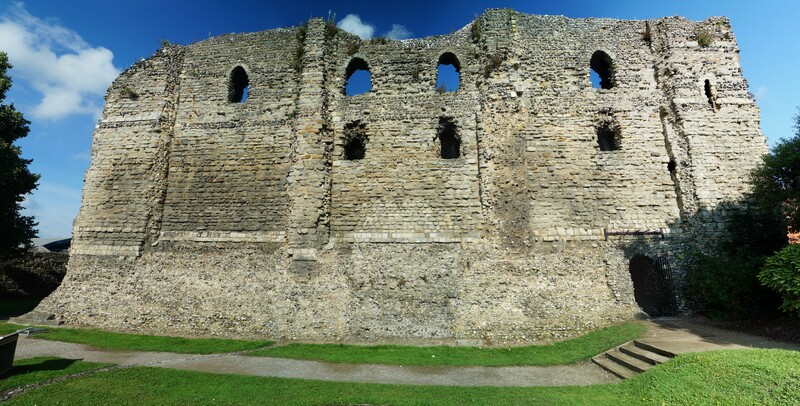 Canterbury Castle Keep. The masonry castle seen today was built as a replacement for the original motte-and-bailey castle in the late eleventh century. Town Walls. The town wall was originally fronted by a ditch but this has now been in-filled. 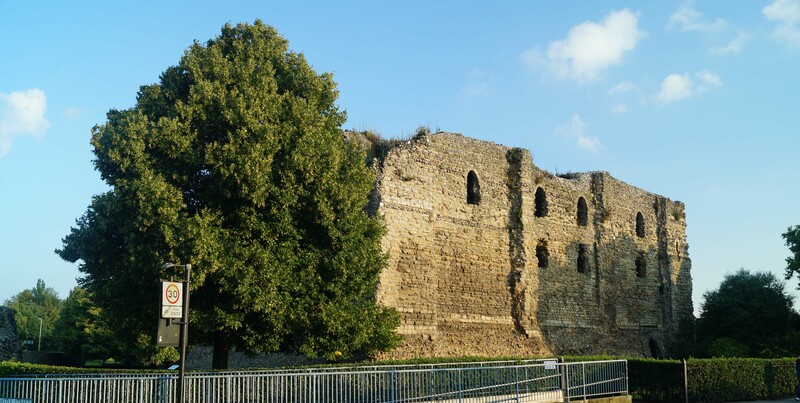 The wall itself was built in the late fourteenth and fifteenth centuries on top of the line of the original Roman wall. Sections of the walls were damaged during air raids in World War II but were rebuilt in the 1950s. Earth Rampart. The walls were built with an earth rampart to the rear. Tower. Many of the towers survive but some have been heavily modified. Different Styles. The protracted building of the town walls led to different architectural styles. West Gate. The town gates were removed in 1780s to improve access for coaches although the West Gate survived due to its role as a prison. 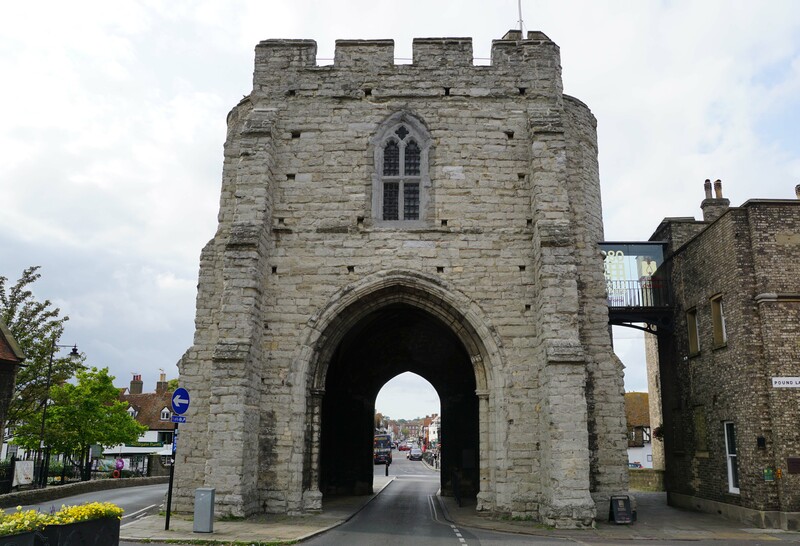 Along with Southampton's Bargate, it is perhaps one of the finest surviving town gates in England. 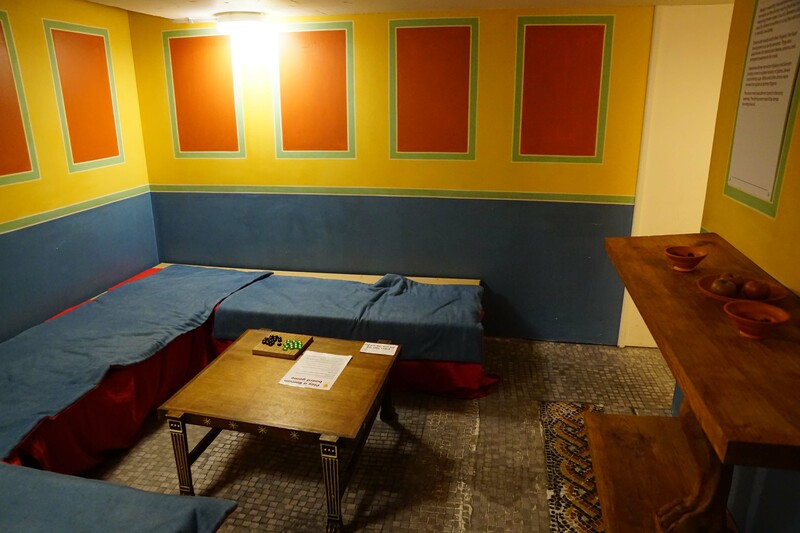 It dates from 1386 and is generally credited to Henry Yevele, master mason for the King. River Stour. A minor branch of the river runs directly through the walled town. Roman Museum. 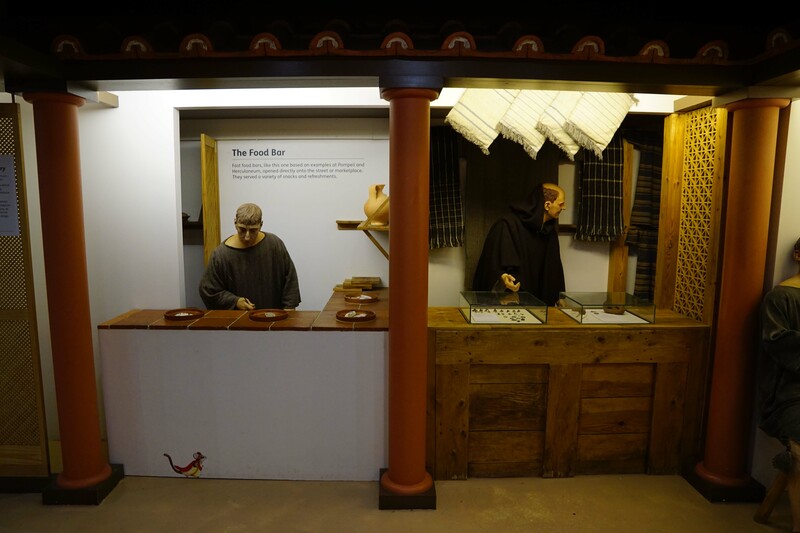 There is a superb museum on Butchery Lane with various Roman exhibits and reconstructions. Canterbury Castle is located at the heart of the city centre. The castle site, Roman museum, cathedral and the surviving segments of the town walls are all within easy walking distance of each other. There are numerous car parking options available across the city with one option shown below.